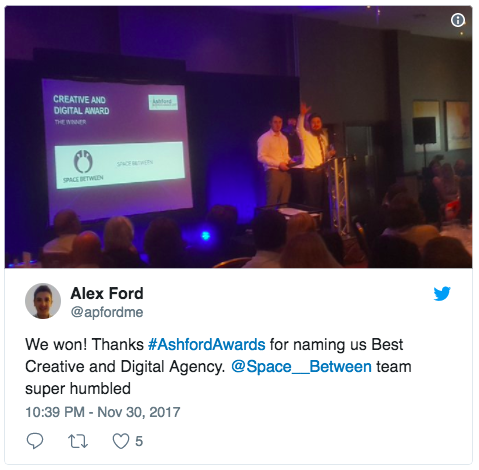 You may remember that a few weeks back, we announced we had been nominated for two awards; Best Creative & Digital Award and Best Start-Up by Ashford Business Awards, part of the Kent Business Awards. The final awards ceremony was held on Thursday at Ashford International Hotel and was attended by a great collection of other successful local Ashford businesses. The evening saw almost 100 attendees sit down for dinner followed by the main event of the awards. Following a great meal, two of our directors, Luke Frake & Marcus Cooke where invited to the stage to collect the award for Best Creative & Digital Award. The team where ecstatic to have one our first award and in Luke's speech he thanked the whole team for their hard work and support in growing the Space Between business with him. 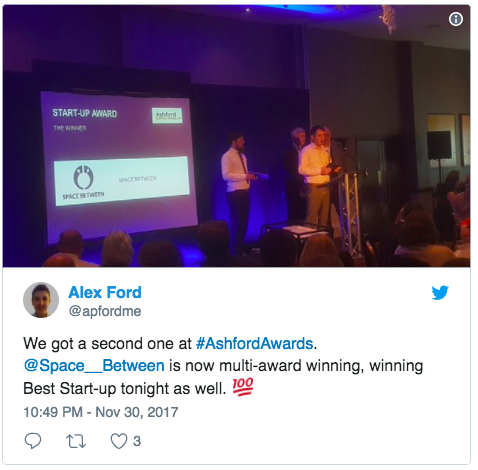 Towards the end of the evening the second to last award for Best Start-up was announced and Space Between was announced as the winner of their second award, making them multi-award-winning! On stage for a second time in the evening, Marcus and Luke stepped forward again and Marcus thanked the team whilst also outlining the Space Between approach of growing and building a team by focussing on doubling every year since the company started. With two awards in hand from the evening the team left the Ashford Awards humbled to have been acknowledged for their hard work and growth over the last two years of trading and excited to look to 2018 for hopefully more awards.